This is one of the few cities in the world where you can journey over by hot air balloon! Book now and away you go, drifting gently over the city of Melbourne in a beautiful balloon. 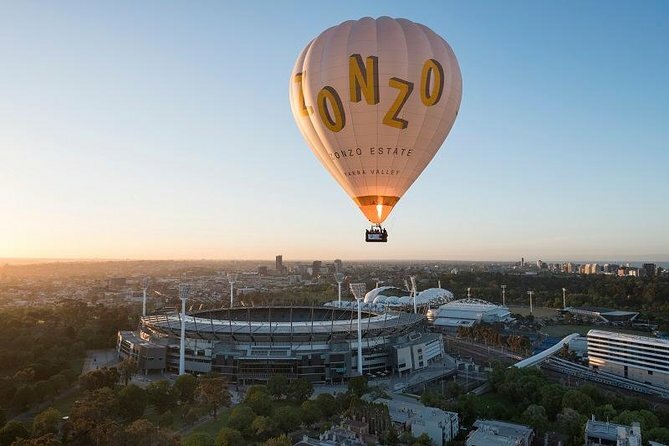 The perfect backdrop for an early morning balloon flight and with complimentary hotel pick ups... there's no better way to start your day in Melbourne! Return to your hotel at 9am so you have the rest of the day to enjoy. Balloon flights over Melbourne appeal to people of all ages - young and old alike. There are few major cities in the world that can be traversed by hot air balloon and there certainly is no better way to take in Australia's second largest city. You will then be transported to the launch site where you may help with the launch, or stand back and take pictures. In the early morning light you will drift by the array of parks and gardens that make Melbourne the world's most livable city. As the city comes to life you will look down on some of the city's iconic venues like the MCG (Melbourne Cricket Ground), Melbourne Park and Albert Park racetrack. Your flight will last for approximately one hour. After the final landing and packing the balloon away, head back to your hotel so you can enjoy the rest of the day in Melbourne on land. If you are looking for a romantic soft adventure that gives you a peek at city life from a totally different angle, then Ballooning over Melbourne is a must. Olympic Torch Relay - the true story !